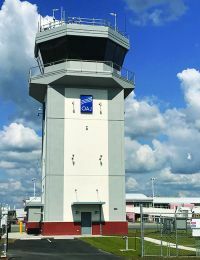 It took a decade, but Albert J. Ellis Airport (OAJ) finally has its own air traffic control tower—a six-story, $6 million structure that officials hope will increase airspace efficiency and bring more air service to the small airport on the eastern coast of North Carolina. Last year, Billy Bishop Toronto City Airport (YTZ) served 2.7 million travelers-quite a jump from just 25,000 passengers in 2005. PortsToronto, which owns and operates the Ontario airport, has invested in several upgrades to meet the growing demand. Improvement projects began on the landside and are now migrating to the airfield. In the last year, Oakland International Airport (OAK) has increased its international traffic by a whopping 73%. That's no easy task-especially given its location directly across the bay from San Francisco International Airport and about 35 miles north of Norman Y. Mineta San Jose International Airport. It was a momentous occasion for Ogdensburg International Airport (OGS) when Allegiant Air Flight 1711 took off for Florida on New Year's Eve. The small upstate New York airport was finally breaking the critical 10,000-enplanement threshold to qualify for $1 million of Airport Improvement Program entitlement funding. 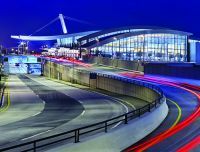 When Christina Cassotis arrived at Pittsburgh International Airport (PIT) in January 2015, the Midwestern airport was a lean and scrappy version of the once-bustling US Airways hub it used to be. With only 37 nonstop destinations on the airport's flight information boards, Cassotis was determined to make her mark. Charlotte Douglas International (CLT) has invested heavily in its airfield maintenance program over the past several years. From airfield markings and lighting to snow removal, landscape operations and wildlife management, the North Carolina airport has committed time and resources to its comprehensive effort. Punta Gorda Airport (PGD) is proving that one size does not fit all when it comes to air service development. The lights are once again bright at Burbank Bob Hope Airport (BUR), thanks to three years of planning and teamwork, plus a giant dose of resiliency. After enduring a complete airfield lighting failure, the Southern California airport rallied to reconstruct an entirely new system. 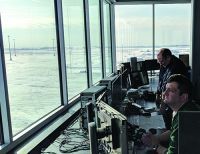 A new air traffic control tower is always a big deal; but the commissioning at O'Hare International Airport (ORD), scheduled for mid-October, is bound to garner extra attention. The tower's non-traditional angular design will undoubtedly turn heads within the industry, and those who look more closely will find notable eco-friendly elements. 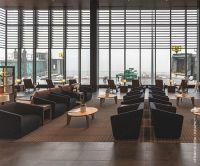 Internally, the opening of the new south tower and runway it will serve moves the Chicago Department of Aviation one major step closer to finishing its $8.7 billion airport modernization program. It has been more than five years since US Airways Flight 1549 was forced to make an emergency landing in the Hudson River after running into a flock of geese shortly after taking off from New York's LaGuardia Airport. But the airport industry is still feeling the effects of the incident. As an airport manager, you've likely been approached about building a solar array on airport property. You're not alone. Since 2007, federal and state tax credits designed to encourage green energy production have prompted private companies to seek out public entities with large undeveloped property, like airfields. 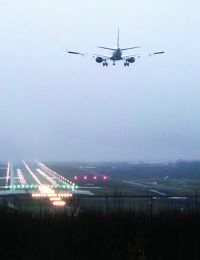 With more than 2.45 million passengers and 176 million pounds of cargo to move last year, Manchester-Boston Regional Airport (MHT) couldn't afford to let weather or wildlife disrupt operations. Fortunately, its Airfield Maintenance Department has developed a variety of measures throughout the years to keep the airport's runways open and safe. A quiet, yet sweeping, transformation has occurred in the way Los Angeles International Airport (LAX) manages and maintains its airfield pavement. Efforts have spanned multiple years, cost millions of dollars and required commitment across many departments. All the work, however, is paying off - in lower maintenance costs, longer lifecycles and safer runways, taxiways and ramp areas. Operations Supervisor Glen Barentine was thrilled when crews painted 14 new surface hold position markings on the taxiways at Hot Springs Memorial Field Airport (HOT) back in January 2012. But his happy demeanor didn't last. Ever since Detroit Metropolitan Wayne County Airport (DTW) opened a new midfield ground run-up enclosure (GRE) last November, its neighbors are snoozing soundly through the night - and noise complaints have dramatically decreased.